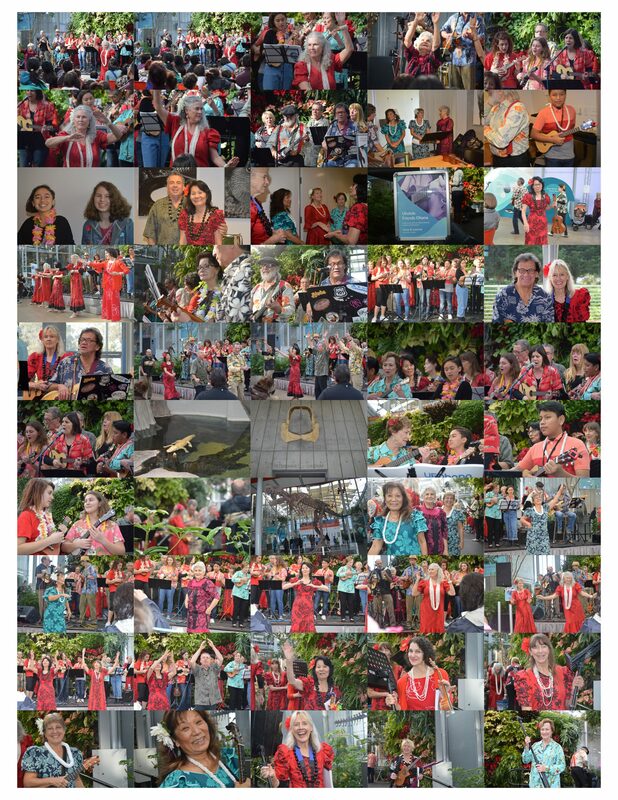 This week’s UFOhana Kanikapilas will be held at the UFOHQ this Friday and Saturday. Check our event calendar for details through the end of the month here. Last Friday was an action packed Friday. It started with group of us being invited to a Kanikapila at Lynwood Elementary School. It was our 6th year of jamming with the Keiki and this year San Ramon Elementary joined in. Amazingly, there were about 220 Keiki participating this year. Many of you may have seen the article on the Marin IJ website. Click here to view it. In spite of that one negative comment of being “culturally insensitive” I assure you that the event was anything but. Lynnette had them sing Koke’e acapella for us. Enough to say that their rendition was so good Uncle Dennis Kamakahi was probably smiling down on them that day. Our hearts swelled . . . click below for photos and videos of that event. Mahalo Nui Loa to Lynnette and her Keiki for allowing us to participate. We are so blessed to have your Keiki as part of our Ukulele Friends ‘Ohana. So after the Keiki Kanikapila we treated ourselves to lunch at Bogie’s Too. Some of you may have heard about their re-opening. There was an article in the Marin IJ, click the image below to few the article online. Congratulations to Michael and Leslie for their Grand Re-opening. By the way, Michael mentioned the possibility of weekend Kanikapilas at Bogie’s Too. So stay tuned! “A little” after lunch it was time for Friday Night Kanikapila at the UFOHQ, which was pre-St. Patrick’s Night aka Green Night. Click down below for the online album. Green Rose Hula . . .
Onward to Green Saturday! Click below to view more of the same. Welcome Back Lopaka! Looking Good! Jake not home . . . Previous PostPrevious 031219: UFOHQ Weekend Coming Up!